Everyone knows the Kindle doesn’t have backlighting. (Readers like the Kindle and the Sony eReader that use electronic ink don’t.) And I’m glad it doesn’t, because I spend all day staring into backlit screens, and that is not something you want to do for hours on end. So what to do in ill-lit situations? Get a book light, obviously. Ah, but which one? 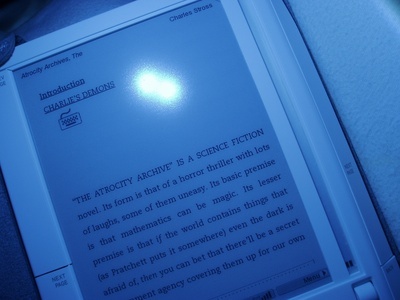 For the Kindle’s screen, as matte as it is, has one problem that most paper doesn’t: glare, if your light’s at the wrong angle. No big deal; that just means you need to get one with a REALLY flexible neck. Like the Mighty Bright XtraFlex2. Runs on 3 AAA batteries (not included), and features two very bright LED bulbs (and, through the love that is being LED lights, use little power and last nigh forever). You can choose to have both on, or just one on, depending on how much light you need. And you can position and angle the head perfectly to avoid glare at just about any angle you hold your Kindle. Above: Well-lit, but no glare. And yes, ’tis Charles Stross’s wonderful Atrocity Archives under the lamp, about a techie whose cubicle just happens to be in The Laundry, a branch of MI that deals with things of a decidedly Cthulic nature. It’s like Dilbert meets Lovecraft and is awesomely funny. For another sampler of “Laundry” stories from Stross, see also his short story “Down on the Farm” on Tor.com (which has a Mobipocket download on the left of that page). But back to: the Mighty Bright! Above: pulling back from the close shot above. It’s a very good cast of bright, white light. Above: the mighty bright in swinging, suavely bent and twisted action! Kind of like an black electrolite swan. The Mighty Bright’s clip is very sturdy, even able to let the Mighty Bright stand all by itself as an impromptu task light. However, the whole thing is surprisingly light, and the big clip’s grip is firm but gentle, not damaging the cover at all. I don’t notice the weight when I’m reading with Kindle in hand. If you’re not a Kindler, I still suggest the Mighty Bright as an excellent regular old book light, too. And yes, in the light of my Mighty Bright, I’m putting together some more eBooks, which folks may or may not be able to see and download. I’ll get to a Shadow Unit eBook update once the last few extras for the year have been posted to http://shadowunit.org. But now… off to finish Stross’s Saturn’s Children, which I think should win a Hugo next year. More on that later this week. The Might Bright is a great product but I also strongly recommend the Flex Neck light by Great Point Light. You can find these on Biggerandbrighter.com. The neck is really flexible and has 2 bright LEDS. I like all the fun colors that it comes in.